Quarterbacks: Kawika Keama-Jacobe (Moanalua), Montana Liana (Farrington), Kalanimoku Pauole (Leilehua), Fatu Sua-Godinet (Kamehameha), Ephraim Tuliloa (Punahou). Running backs: Kesi Ah Hoy (Kahuku), John Barbieto (Waianae), Jordan Bayudan (Kamehameha), Onosai Emelio (Maui), Challen Faamatau (Farrington), Michael Feliciano (Moanalua), Louie Garcia (Kealakehe), Terell Johnson (Campbell), Daniel Kelly (Maui), Keenan Luis (Baldwin), Randy Neverson (Leilehua), Ikaika Piceno (Leilehua), Paepaeiva Silifaiva-Kaeha (Kailua), Jahred Silofau (Saint Louis), Tristin Spikes (Hilo), Jurick Valdez (Waianae), Salanoa-Alo Wily (Kahuku). Wide receivers/slotbacks/tight ends: Allan Cui III (Saint Louis), Karson Cruz (Moanalua), Chad Figueroa (Castle), Naliko Kea (Kapolei), Tyreek Keough (Leilehua), Lauriano Lucas (Leilehua), Micah Maa (Punahou), Tristan Nichols (Maui), Kumoku Noa (Kamehameha), Jimmy Nunuha (Saint Louis), Bronson Ramos (Mililani), Kona Reiny-Aloy (Campbell), Kaulana Werner (Kamehameha), Kainoa Wilson (Mililani). Offensive linemen: Antonio Ala (Mililani), Arona Amosa (Campbell), Sean Auwae (Kapolei), Kolby Castillo (Aiea), Brett D'Amato (Mililani), Kanai Eldredge (Punahou), Larry Goeas (Saint Louis), Nathaniel Herbig (Saint Louis), Farao Maileoi (Farrington), Louis Matagi (Farrington), Netane Muti (Leilehua), Derek Nishimoto (Punahou), Pesi Savea (Kapolei), Victor Tualau (Kahuku), Chris-Jordon Ulufale (Kamehameha). Defensive linemen: Makoa Chapa (Saint Louis), Zeno Choi (Kaiser), Soga Eli (Leilehua), Kahewai Kaaiawaawa (Mililani), Maika Koko (Waianae), Seufagafaga Luafatasaga (Farrington), Tristin Ludiazo (Campbell), Josiah Mageo (Campbell), Kaimana Padello (Mililani), Roman Salanoa (Kahuku), Joseph Saula (Punahou), Kataferu Seumalo (Mililani), Atunaisa Vainikolo (Maui). Linebackers: Soli Afalava (Kahuku), Kea Cambra (Campbell), Onosai Emelio (Maui), Reupena Fitisemanu (Kahuku), Tainoa Foster (Kamehameha), Isaiah Gibson (Campbell), Parker Higgins (Kaiser), Justice Jardine (Waianae), Laakea Look (Punahou), Sam Naulu (Kapolei), Sioele Naupoto (Kahuku), Kiliona Pomroy (Hilo), Jeremiah Pritchard (Farrington), Kea Rodrigues (Moanalua), Tyson Tafai (Campbell), Alexander Vainikolo (Maui), Aaron Yoshida (Moanalua). Defensive backs: Toa Augafa (Saint Louis), Kyle Bender (Moanalua), Tristan Centeio (Kapolei), Gabe Igafo (Aiea), Dylan Kane (Kamehameha), Donavan Kelley (Hilo), Cody Kim (Kaiser), Hirkley Latu (Kahuku), Jedadiah Lulu (Saint Louis), Malcolm Macatiag (Kahuku), Haili Mahoe (Hilo), Austin Molina (Leilehua), John Ofahengaue (Kahuku), Deshaun Osborne (Leilehua), Siaosi Pakileata (Farrington), Malik Smith (Kapolei), Tyson Takabayashi (Maui), Salamanesa Taufi (Waianae), Dayson Watanabe (Punahou). Kickers/Punters: Noah Crabbe (Kamehameha), Marc Matas (Mililani), Gabriel Pinheiro-Alves (Kahuku), Kona Reiny-Aloy (Campbell), Matt Sai (Kaiser). 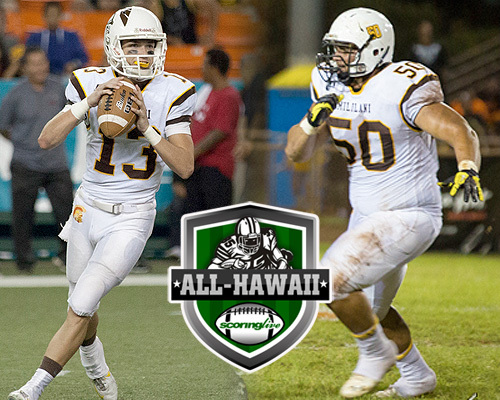 Other coaches that received consideration: David Baldwin (Hilo), Cameron Higgins (Kaiser), Lee Leslie (Kahuku). While one quarterback from Hawaii with the initials "MM" is lighting up defenses at the Division-I level in college, another one was just as masterful in the prep ranks in 2014. McKenzie Milton's value to the Mililani football team was undeniable as the triggerman for the high-powered offense. The 6-foot, 185-pound junior threw for 3,392 passing yards and 35 touchdowns, which are both tops in the state. He averaged 282.7 passing yards per game, completed nearly 69 percent of his passes and was intercepted just eight times on the year. "Hands down, he's the best player in the state," Kahuku coach Lee Leslie said. "He makes everything happen for his football team. I love seeing a great quarterback and he has all the intangibles to take off. He's a special young man." Milton threw for at least 300 yards in three games this season. He opened the season with 367 passing yards and four touchdowns against Saint Louis and followed that up with an efficient 14-of-17 game against Kailua for 295 yards and two touchdowns. "You can tell by watching McKenzie from last year to this year that he worked hard to improve his passing ability," Farrington coach Randall Okimoto said. "He had the ability to run the ball already, but he became a dual threat when he became a passing threat." As a sophomore in 2013, Milton threw for 1,626 yards with 16 touchdowns against seven interceptions. He completed 137 of the 230 passes (59.6 percent) he attempted last year. Milton completed 238 of his 346 passes thrown this year. "You can't give him time to throw because he will find someone and then if you try to (blitz) him up the middle, he'll go out of the pocket and if you try to get him off the edge, he'll step up in the pocket and he's the fastest quarterback I've seen in Hawaii, by far," Moanalua coach Jason Cauley said. "He's a nightmare to play against, but a fine player to watch." Milton was second on his team with 808 rushing yards and 12 touchdowns on 96 carries. He ran for 100-or-more yards four times, including a season-high 204 yards and three touchdowns against Saint Louis. but he saved one of his best performances for last, when he threw for 421 yards and seven touchdowns in Mililani's 53-45 win over Punahou in the D1 state final. "He was clutch for them in all the big games that I was able to watch," Buffanblu coach Kale Ane said. "I think he's outstanding and a great player and a great representative of an award like that." Punahou senior wide receiver Kanawai Noa also received consideration for the award. When opposing coaches were asked for their thoughts on Mililani's Rex Manu, their most common initial reaction was a breath of relief that they no longer had to structure a game plan for the standout defensive tackle. "He's just a man-child. We couldn't block him for three years, so I'm glad that he's graduating," Leilehua coach Nolan Tokuda said. The 6-foot-2, 290-pound senior was the catalyst for the Trojans' 4-3 defense this season. By head coach Rod York's count, Manu registered 42 solo tackles, 13 sacks, six forced fumbles and three fumble recoveries. "That guy is an impact player. Wherever he is you've got to be aware of him," Farrington coach Randall Okimoto said. "He never takes a play off while he's on the field. He just goes 100 percent all the time. He's has the ability to be a run stopper and a pass rusher, and you have to double him most of the time. He's just a force to be reckoned with." As a junior Manu played alongside 2013 All-Hawaii Defensive Player of the Year, Kelii Padello, and in front of a trio of senior linebackers, including First-Team selection Jacob Afele and Second-Teamer Dayton Furuta. Despite their departure to graduation, Manu hasn't missed a beat. "You just can't move the guy," Moanalua coach Jason Cauley said. "He's extremely athletic for his size. He can split blockers, run over them and just cause havoc in the backfield, which allows one of his teammates to make a play. He's just a monster and he makes things happen and energizes that defense. He's big, strong, fast for his size and he's a good kid, too. I like Rex and I respect him a lot." Punahou coach Kale Ane knows Manu all too well. Manu attended Punahou before transferring to Mililani as a freshman. "Rex was disruptive force in the middle of the line and it really made people change their approach to either how they're going to block or where they're going to run," Ane said. "He was consistently a dominant player and a big reason for (Mililani's) success." Manu's future is still an uncertainty as he reneged on a verbal commitment to Stanford prior to his senior season and is still weighing his options. The University of Oregon is thought to be a frontrunner among the many suitors. "He's just a very, very solid player," Kahuku coach Lee Leslie said. "I know a lot of coaches around the country and each time someone calls me about a kid I have, I've always given them Manu's name, too. He is a big-time player and will have a lot of success in the future." Manu edged Kahuku defensive lineman Salanoa-Alo Wily for the award. Mililani's march to a perfect 13-0 record and its first state football championship in school history was led by its high-scoring offense and supported by a Rex Manu-led defense, but to be sure, the path was paved by fifth-year coach Rod York. York and the Trojans began work on the 2014 season not long after last year's ended with a 28-22 loss to Punahou for the Division I state championship. The players dedicated themselves to offseason training that began in February and included countless weight-lifting sessions, Saturday beach runs at Ala Moana, and even a summer trip to Oregon for a taste of mainland competition. "After they lost to Punahou last year I told Rod, 'Good season,' but you could hear in his voice that he was disappointed," Leilehua coach Nolan Tokuda said. "I told him that it took John Wooden 10 years to win his first championship, but then he won 17 championships and that he's ahead of the game, because some coaches coach their whole career and never get to the championship game and he's already had a taste. He said that next year he would leave no doubt." All of the hard work culminated with a 53-45 win over the Buffanblu a year later. It was just the 19th time in the Prep Bowl- or State Championship-era that a team finished the season unbeaten and untied. "His attention to detail, his dedication to players and his focus was tremendous, so it's well deserved," Tokuda said. As one Mililani assistant told us, York stressed two things all along: "Execute" and "Do your job." "The kids bought into the system and the belief that as long as we're doing what we're supposed to do, in the long run, the game should turn out to our favor."